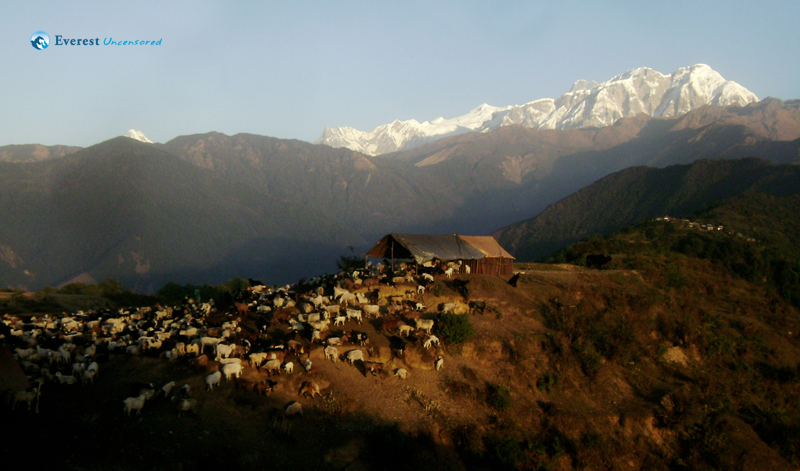 Ghalegaun is a small village in Lamjung District of the mid-northern region of Nepal. It is a typical hill station consisting of about 70 to 80 houses of the local Gurung tribe. The local Gurungs are the Royal Gurungs and are called “Ghale”. In Picture are local shepherds herding about 700 sheep. The owner is a local of the Ghale Uttarkanya Village Development Committee (VDC). Sheep are taken care of by the local shepherds who use trained dogs to help them. Sheep are used to get milk, ghee, cheese and Radi (Blanket). Incomes are distributed according to the ownership. The VDC also pays the salary of the local community schools teachers with the income from the sheep husbandry. Sheep are never tagged but the shepherds know which ones belong to which owners!